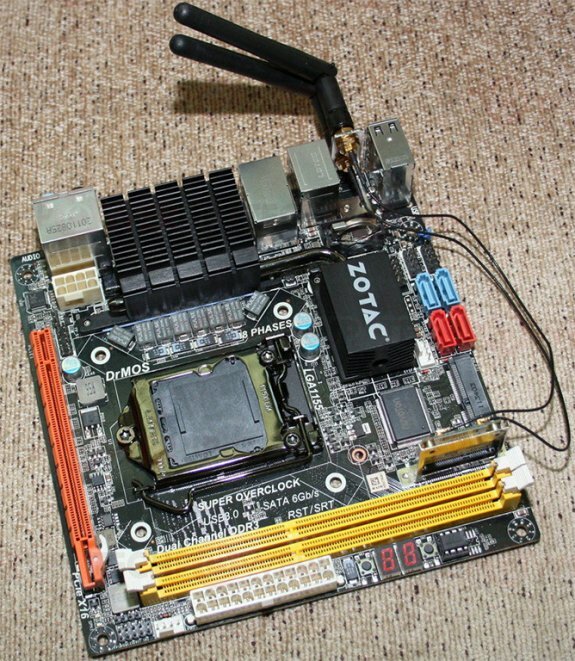 Zotac also showed off a new Intel Z77 based Mini-ITX motherboard that is aimed at small form factor overclockers. This LGA1155 board draws power from 24-pin ATX and 8-pin EPS connectors, it comes with 8-phase VRM, with a feature-rich controller, Pulse-made inductors, driverMOSFETs (DrMOS), and High-C capacitors. Ivy Bridge is supported out of the box, and the LGA1155 socket is powder-coated to prevent shrinking when subjected to subzero cooling. The CPU is wired to two DDR3 DIMM slots supporting dual-channel DDR3 memory. The lone expansion slot is a PCI-Express 3.0 x16. Storage connectivity includes two SATA 6 Gb/s, two SATA 3 Gb/s, and an mSATA slot (likely 3 Gb/s). Display connectivity only includes DVI and HDMI. General connectivity includes 8-channel HD audio, gigabit Ethernet, wireless b/g/n, and USB 3.0. This board will have a feature-rich UEFI BIOS.